No need to shy away from color. 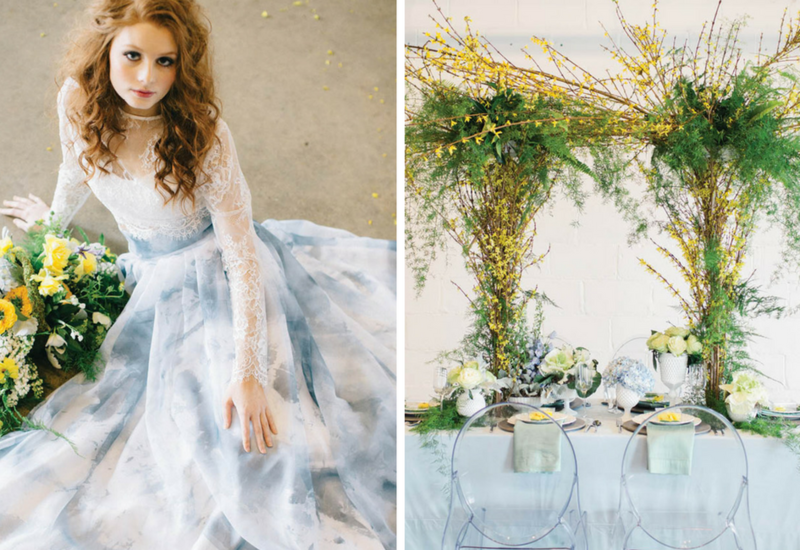 This wedding palette, with soft hues and lush florals, will stand in as your something blue. 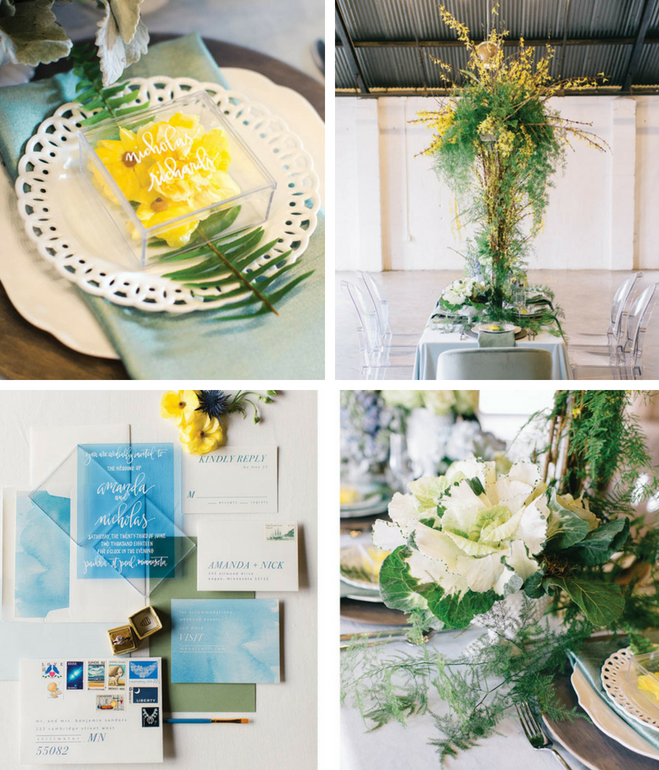 Denae Brennan, owner of Denae Brennan Events, masterminded this fresh wedding design, pairing an abundance of florals with soft colors—think sunshine yellow and sky blue. It’s light, it’s airy, it’s modern, it’s a perfect fit for a garden party. What a showstopper! Christi Poppler, owner of Studio C Floral, created this standout arch that’s sure to turn heads, with forsythia, springeri, plumosa and sword fern. The blooming branches instantly brighten up your reception space while designating the head table, where you and your new spouse can toast to happily ever after. How special will guests feel when they discover these personalized place settings? (Answer: So special.) The transparent acrylic boxes, with hand-lettered name and fresh flowers tucked inside, make wonderful favors to remember your big day. This wow-factor head table is all about luxe, from the sleek acrylic chairs to the velvet linen and plush floral arch. From their first peek at the invitation suite, guests will know your wedding day will be one to remember. Stillwater-based Champagne Press created this invitation on transparent blue acrylic, with playful calligraphy by Rosann Konieczny calling out the who, what, when and where. 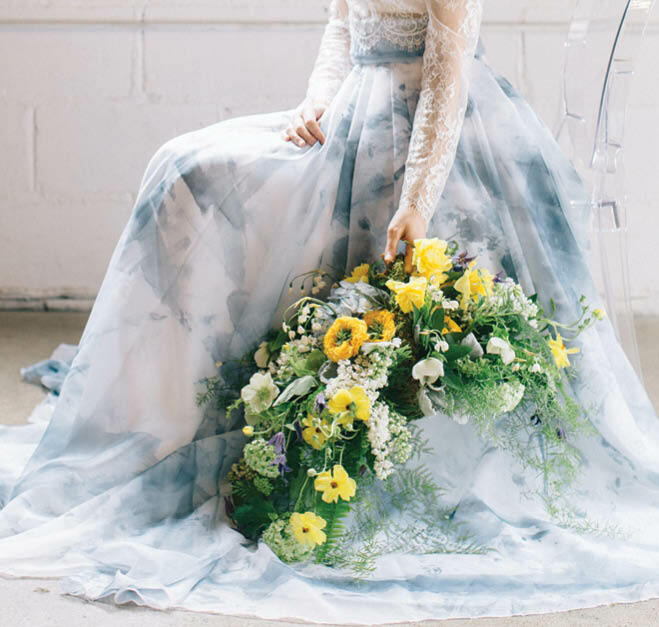 Watercolor cards and liners coordinate with the bridal gown, while vintage stamps sourced from Edelweiss Post, an Etsy shop based in Minneapolis, prove you’ve thought of everything, down to the last detail. Such pretty blooms! Here, lemonade roses, ornamental kale, delphinium and hydrangea, paired with sword fern, springeri and dusty miller add shimmer to the table. 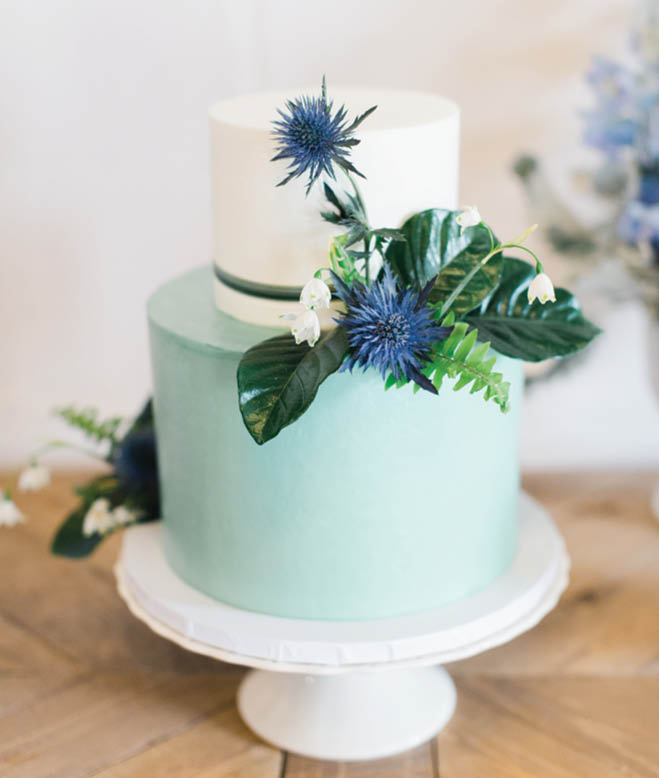 Excelsior’s Farina Baking Co. whipped up this elegant two-toned cake, blocking eggshell blue and solid white. Add just a touch of floral—eryngium thistle, gardenia foliage, lily grass, and leucojum are shown here—to bring it to life. “What’s more spring than a basket full of fresh flowers?” asks Brennan. Nothing—that’s why Studio C Floral created this basket bouquet, with a moss-covered handle and luscious spring blooms like lilac, hellebore, viburnum, daffodils, butterfly ranunculus, leucojum, clematis and garden roses. It’s so delightful to carry, you’ll never want to put it down. Flirty, flowing and unforgettable: With a cropped lace top and free-flowing blue marble skirt, this Sweet Caroline dress makes for a memorable walk down the aisle and spin on the dance floor. 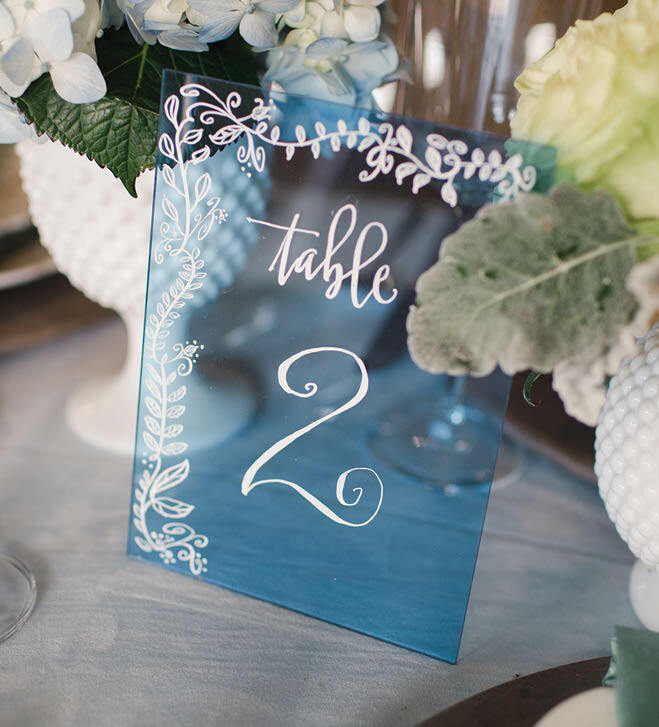 To coordinate with the invitations, table numbers were created on blue acrylic. The scrolling floral designs, also hand-drawn by Konieczny, are whimsical yet elegant.